The rocky slopes of the Sierra del Escambray slipped into the darkened countryside moments before dawn as our car made its way along the winding autopista—a two-lane highway that cuts through the verdant expanses of central Cuba. We were heading toward the western end of the island that cool, May morning—specifically Santiago in Oriente province, nestled in the Sierra Maestra mountain range. Before we could reach Santiago, we had an important stop to make—a stop that made the first half of our journey a spiritual pilgrimmage. We had to stop at El Cobre, a small mining town about 30 minutes east of Santiago where a shrine stands commemorating the Virgin of Charity (La Virgen de la Caridad), Cuba’s patron saint. 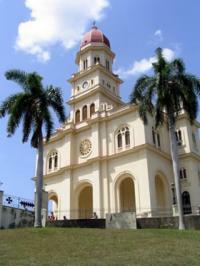 The Virgin of Charity is an iconic figure to all Cubans, regardless of whether they live on the island or are in exile. Prayers, requests, and promises have been made by millions of faithful Cubans in need of the Virgin’s divine grace or intervention since she first appeared off the shores of Cuba more than 400 years ago. Culturally, the Virgin of Charity is a figure that trancends the discourse and rhetoric that has divided the Cuban population for half a century. In faith, she unifies the splintered culture across physical barriers and polarized polemics. Born in Miami on the Virgin of Charity’s September 8th feast day, I always grew up experiencing a sense of joy from my family members—particularly my grandmother—who were happy and proud that I was born on this symbolic day. I also grew up observing and experiencing the collective sense of reverence exiled Cuban-Americans felt as they celebrated their beloved saint on her feast day by wearing yellow clothing—the Virgin of Charity’s color—to mass or buying yellow flowers every year. As a kid, it was always just another birthday to me that happened to coincide with the saint’s feast day. But the power of faith surrounding the Virgin of Charity has always been hard to ignore even at a young age. Over the years, I have visited her shrine in Miami countless times with family members. But I had never been to the original shrine in El Cobre. Now, every mile that rolled by brought me closer to making a place-based connection—to bridging a spacial gap that exists between the Cuban culture I grew up knowing in Miami and one of its icons in a seemingly distant island that was once home. As the faint rays of morning sunlight shone brighter and brighter and turned into the midday sun, the landscape transformed into rolling pastures populated by grazing cattle and tall, slender palm trees. We crossed several bridges overlooking quiet rivers and undisturbed valleys. The day grew hotter as we entered Oriente, a region of Cuba known for its blazing heat. A shadowed outline of the Sierra Maestra rose in the distance and soon the road began to wind through this rugged mountain range. After some time, a drop appeared on the right side of the road. A valley opened up beyond the brush lining the roadway and there—surrounded by a chain of green mountains soaring above ground level—appeared the basilica of the Virgin of Charity. A series of images I had seen of the basilica throughout my life seemingly flashed through my mind as I viewed the actual site for the first time from the car’s passenger seat. A sacred location—one that I had only vicariously experienced through the stories and tales of family, friends, and relatives living in Miami—had come to life. That theory suddenly became true to me. I observed the copper mines at the foot of the mountains—the same ones I had always heard about—as we walked to the entrance. We entered the basilica and my mom knelt down to pray at one of the pews. Her sister and my grandmother did too. I sat in a pew and studied the small statute of the Virgin of Charity, which is encased in glass above the alter. I knew that it would be hard to view her feast day as just another birthday ever again.